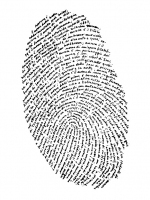 Instructions: Using an ink pad make a print of your thumb in the center of a white page. 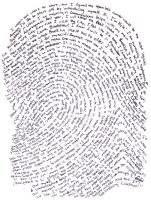 Enlarge this thumb print on a photocopier to match the approximate size of your face. Place a thin sheet of copy paper over the photocopied enlargement of your thumb print and secure it in place with tape or paperclips. 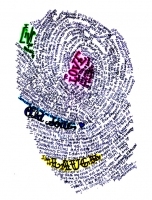 Starting anywhere you wish and using a black ink pen and your natural/everyday handwriting, compose a text about yourself following the contour lines of your thumb print as a guide. Use a light box or window to improve the show-through. 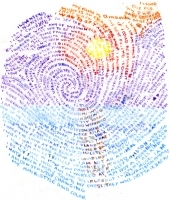 The final result combines your text, your handwriting, and your finger print to form a self portrait. Please note: Previous participants in this project sometimes employed different coloured pens and formal lettering or type-styles to enhance the visual complexity of the portraits and give more character to the graphic outcome of this project. Please try to follow the simple instructions above as carefully as possible using black ink and your everyday (natural) hand lettering. The goal of this effort is to produce a set of self portraits that are as formally consistent as possible, yet, when studied, reveal the individuality and uniqueness of their authors.